We're underway in Melbourne and Roger kicked off his Australian Open campaign with a comfortable straight sets victory over Yen Hsun Lu to move into Wednesday's second round. Taking centre stage in Evening session on Rod Laver Arena the Swiss defeated his experienced opponent 6-4 6-2 7-5 in 1 hour and 53 minutes. As with most 1st rounds for the top seeds this was relatively one sided throughout. Fed was in cruise control for the opening two sets but in third Lu upped his level and Roger had to weather the storm for a few games before breaking decisively at 5-5 and holding serve to setup a clash against Simon Bolelli in the 2nd round. Roger said in his pre tournament press conference that he had played great in practice over the last 2 days and he was out the blocks quickly in this one; creating 4 break points in game one but failing to convert. He again held a break point in game 3 before Lu held to lead 2-1. At 2-2 the Swiss finally got the breakthrough and then held for a 4-2 lead. One break proved to be enough and at 5-4 we probably got the point of the match before Roger served out the set to love. The second was a similar story, with Lu again holding his serve until 2 all before Roger broke serve and then held for 4-2 hitting an epic volley in the process. This time around Fed managed to get the insurance break and quickly moved into a 5-2 lead. Lu had 2 break back points to cut the deficit but Roger fired down some clutch serves to take the set 6-2. With Roger dominating the two opening sets at a canter the third was to be a much closer affair as Lu upped his level on serve and applied pressure on the return whenever he got a look in. Roger had to save two break points at 0-1 with some good play under pressure and the Chinese-Taipei native looked untroubled on serve. At 3-3 Lu had to save his first break point of the set before holding and the scoreboard soon ticked over to 5-5. Here it was time to strike a hammer blow and the GOAT delivered, breaking to love easily, almost making it look like he'd been testing things out throughout the third set and decided enough was enough; he then served it out to 15 to take it 7-5. Nice! I think he started to serve better in the third. I think conditions slowed down a bit. Because of the coolness and the night coming in, I felt it was hard to generate stuff. It became a very interesting third set. Gave me, I think, a lot of information. Instead of sort of just steamrolling through him he really made it tough for me. I don't want to say I got lucky to not be broken early on in the third, but he was playing some really good tennis. I started to mix it up and trying out things because I had to, I felt, towards the end of the third. Started to serve better myself again towards the end of the match. I adjusted to the conditions, because it did play different at 7:00 than it did at 8:30. A drastic change, in my opinion. A routine first round here to be honest and I thought Fed played some pretty good stuff. Definitely worth watching the highlight reel as he came up with some top notch net play, an around the net post winner and a couple of majestic drop shots that left Lu looking puzzled. Good stuff and pretty much on cruise control throughout. The stats make good reading too and he definitely served well from start to finish, barring 3 double faults which fortunately didn't cost him. Perhaps a tad lucky to not go down a break in the third but he staved off the break points with some clutch play. Other than that the only real negative was a fair few forehand errors from shanks, probably to do with lack of timing / rhythm though so no big deal. In terms of conditions the surface looks to be playing medium fast from what I saw on TV, not easy to put the ball through the back of the court but possible with the right combination of shots. Interestingly Roger says the conditions changed quite drastically from 7.00pm to 8.30pm and the court slowed up which gave Lu more time from the back of the court. Not ideal for him so I think his net play is going to be hugely important this tournament, we saw some great plays tonight where he closed off all the angles and used his reactions to cut off good passing shots so more of the same required on that front. Elsewhere in the draw no real upsets other than maybe Gulbis losing to Kokkinakis in 5 sets depsite having 4 match points. That guys a joke though so no real surprises, he's always a disappointment in Australia and it doesn't look like it will change anytime soon. As for Nadal he crushed Youzhny in straights earlier in the day; I expected a closer match but I've watched the highlights and Youzhny is a shadow of the player he was, now he was never a world beater but his legs have gone and so has his pace on the groundstrokes. Nadal just bossed every rally from the back of the court and it was easy pickings for him. Good win for his confidence so he could be a threat now but he's far from tested. As I predicted in my draw post Bolelli is the man waiting in the second round after he defeated Juan Monaco in 4 sets. The Italian clearly has too much for a defensive baseliner like Monaco and came through comfortably. Roger has a 3-0 H2H Record vs. the world number 48 and is yet to drop a set in any of their previous encounters. 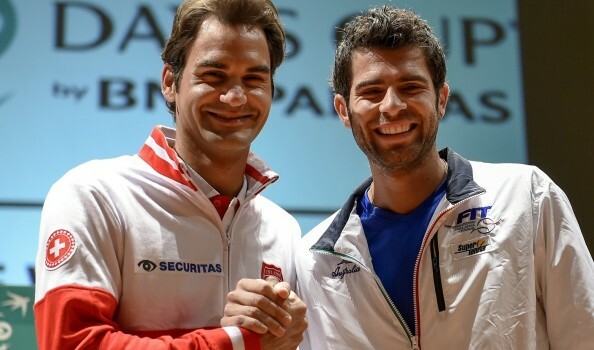 The most recent meeting between the two was at the Davis Cup in Geneva after last years US Open and it was a close tie where Roger's experience prevailed to win 7-6(5), 6-4 6-4. Unlike Monaco the Italian definitely has weapons in his game and his forehand is his best shot. That's something Roger will need to aware of as Bolelli becomes dangerous if he can bring that shot into play. I think with the way Fed's serving he should be able to come through this one handily in straights 6-4 6-4 6-2. There should be some decent rallies too as both guys go for their shots and hit with one handed backhand; hopefully it will be a good watch. See you guys Wednesday in Live Chat! Precision serving and good net play to get the job done. One down, six to go! Can’t agree. youzhny Mae Nadal look better than he was. True Susie but Nadal was running for a lot of balls which suggests that his movement is looking good, Nadal plays himself into form and he’s quite fresh. Given his draw, he should make second week with relative ease, he’ll be dangerous. Don’t believe Nadal not being tested will hurt him, Berdych probably the only barrier to the semis for him but who is gonna put their faith in Berdych for that match lol. Hmm, not a lot to say about that really, is there? So, simply: I still like the shirt (think it looks nice and cool, bit like a tropical cocktail or something), but not convinced about combining it with the shorts. Yeah clearly was pretty bad based on that snippet. But think we kinda knew, obvious he took some sort of meds to play Davis Cup. rf_link’s Twitter account had some reference to Roger having a back spasm against Gasquet in that last DC rubber. Anyone got a quote? It’s not from the presser I quoted. Indeed, not great as will favour good runners like Djoker, Nadal and Murray but I hope Fed can bring something different to the table, he has more variety than any other player. Could be interesting if it rained for Fed/Murray or Fedal. Roger given the edge indoor. Good post as always Jonathan.About the match.FH leaked some errors but I liked the aggression. The BH was really good as was the serve in general. I hope he stays with the aggressive return he showed here and in Brisbane even if it means some errors.Lu played rather well, at least 10x better than Youzhny. Good first match. As long as more winners than errors. That is how Fed himself views it, but 24 on the FH needs addressing. I did Think court looked slow as match went on, but also Lu played better and served better. Good opener for Fed. As he said, he will Hv learned a lot! Bolelli next, Fed thru in straight sets! I checked in a few times and missed optimum time again! No matter…all I care about is Roger getting the win. Pretty much as expected, although a few more UFEs than we’d like, but to be expected with a first match. Overall I thought Feds looked pretty sharp, great serving/volleying, and moving very well. I watched Nadal/Youzhny match and you’re right Jonathan. Haven’t seen Y play for some time and he IS a shadow of himself. Very poor movement and apart from one game in third set he looked like he was just going through the motions. Very disappointing. I used to quite like Youzhny: has he had a lot of injuries lately? Nadal looked OK but it was quite hard to tell when Y was so poor, with stupid Mats W gasping at every half decent shot that Nadal hit. Can’t believe Gulbis – he’s said he would like to get to No1 (clearly delusional). I thought he was getting a little more serious about his tennis, but he’s one big disappointment, and I’d picked him to go through a couple of rounds so he’s messed up my tennis picks! As has Robredo – only 5 games and pulled out, not good. Me either, not since Wimbledon vs. Murray I think was the last time I saw him play. I liked his game too, has a decent backhand but clearly on the downhill, bit like Davydenko, just fading. Gulbis is a clown, mentally terrible. Robredo – should have given his entry to a lucky loser. Agree re Tommy. what a waste of a place in the main draw! Shldnt be allowed! I did wonder if Gulbis was going to lose – justifiably, as it turns out. And yes, Robredo: tough on the spectators, and on the lucky loser who missed out. But then this has happened quite a lot since the first-round prize money went up. In other news British tennis is in great shape. 🙂 Murray the sole survivor as usual…no surprise there. Even I missed the first few games, stuck in traffic ffs, set off way earlier than usual too! I thought Fed played a decent match vs. Bollelli in Geneva, slow indoor court so not his ideal surface. Should be an interesting match, hard to see anything but a Fed win but he’ll need to be on good form against the Italian. Having watched some highlights of both Nadull’s and Novak’s matches, I am slightly annoyed as the fact that Roger had to play properly and even well in the 3rd set, whereas Nadull and Novak did exhibition stuff. This guy, Bedene, could not even dare to hit a shot, when Nole gave him at least half a dozen chances, pathetic. Clearly, Nole was saving up his energy. I’m not big on the outfit either, looks better than Roland Garros 2010 and 2013 though I think, those some of my least favourite. Along with Orange from Miami in 2010 too I think. Don’t mind it but annoyed with Nike to hv him and Nadal looking like twins! And where are the polos? There are too many players wearing the same outfits now. V boring! I’ve decided I quite like that the color matches the tennis ball. But I still wish they’d put a green collar on it. Can’t decide about the vertical back stripe versus running the front horizontal stripe all the way around…. it’s okay, I guess. I actually quite like Kokkinakis’ kit, though it’s definitely wild! His self-talk during his match apparently included something along the line of, wearing this, I mustn’t lose! Kokkinakis’ kit is a shocker. Worst I’ve seen in a while across the board. Maybe even worse than Berdych playing in Huddersfield Town’s kit last year. Thanks Jonathan, not much to add. Just felt that Roger could have done with two lower-ranked players for the first two rounds. Rendy played really well today and he pushed Roger hard. Roger played very well with no rust at all. I hope that Bolletti match in round two will be a bit easier. This guy is a good shotmaker. Allez Roger! One done six to go! It’s Randy, actually. He spent a fair bit of time in The states and speaks the language. Clearly richard was too optimistic about me finishing year-end top 8, but hey consistansy is my strength, right? Great write-up for the great first match, Jonathan. I thought Fed lost focus a bit in the third set though as you said he played good and produced quite few exquisite shots here and there so it was a joy to watch. And he was serving like a God really! Shame that the on-court interview wasn’t done by Jim Courier…I was looking forward to it. As for the outfit, looked better than I thought. Thank god the shorts were not embarrassingly short and tight but still hate the shinning line on the side, tacky! Yeah he definitely switched off a tad, but Lu did play better. Shorts are tacky as. Outfit not terrible but pretty poor. Oh and thanks Conal and Jonathan for the long waited video ‘Fed’s Best points of 2014. Superb collection, amazing effort, well done, Conal! Fed and we had such a great year last year, didn’t we! Many thanks indeed Conal, so many jaw-dropping, breathe-taking shots and it made my lunch break so much enjoyable. Thank you Wanda for the link 🙂 . Decent start by Roger, outfit aside I think he is playing himself into form. Did not over exert himself in early stages but doing enough to get a W. Next match will be interesting, likely he will get a day match or bumped to HiSense or MC since there are a few interesting matches on for the Aussie boys in rd2. 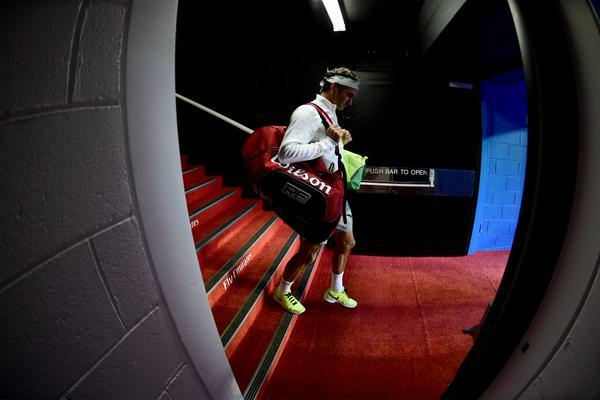 Regardless, lets go Rog!!! Didn’t mind the outfit actually, except for that reflective green stripe on the shorts, Nike’s design team deserve an F for giving Fed and Nadal the same features. Also weird that Fed doesn’t have a day and night session outfit this year. Great birthday present for Edberg 😀 Solid first round, testing third set for Roger but he was clutch when he needed to be and made a push at the right time. I think Fed was missing some intensity until that third set and it’s important he gets whatever rhythm he can to make sure he’s confident and comfortable on the court- crucial in conserving energy. Court looked slow from my perspective in comparison to the other courts which is a bit of a joke each year the two hard court slams come around, but it was quite cool in Melbourne last night so during the day RLA and MCA should play quicker. So far, I’m liking Roger’s commitment to the net, should be handy against Bolelli who had a good run in Sydney. Also, not surprised about the Nadal result, as soon as he started downplaying his chances in the media, it was a sign that him and Toni are ready to play. P.S Was anybody missing Jim Courier? I certainly was, he was put on for Kyrgios’ match. Hope he will be back on Wednesday. Me! Yes, hope Jim will back, Alysha, he brings Dorkerer out! Yeah who gave the interview instead? They’re too busy trying to be funny these guys and it ends up awkward. Thanks for the write-up and highlights, Jonathan. Most of these matches will be in the middle of the night for me. So, no live chat. The shirt is ok. Don’t like the shorts esp the stripe. I think white shorts would have been better. Yeah, what’s with Roger and Nadal wearing similar stuff. Shame on Nike again. I remember the AO in maybe 2011 when everyone wearing Adidas gear were in yellow, grey and white. Yes, Youhzney, isn’t the same player. Sad to see. Lu looked so happy at the net. Perhaps it`s a thrill to play Roger on centre court regardless. Roger seems to have great anticipation at the net these days. Thanks Stefan! Of course – when was the last time Lu would have played in front of such a crowd? Maybe Wimbledon 2009… he put up a good showing too with some good rallies. Both Novak and Koenig mentioned that the courts are playing faster this year. Although where they had reached, I doubt they could have become any slower. Interesting. Craig O’Shannessy said slower on Twitter, outside ones are quick. Showcourts slow. It’s a win :d! I am still tensed for every match regardless who is on the other side. Looks like Mirka put in the same training block as Fed, she has certainly dropped a lot of baby weight. Nice job Jonathan, like the Perfect Tennis flash before the highlight reel , brilliant. Conal, 30 mins of pure joy! cannot the you enough! Sooo many highlights! Into the 2nd round is Tilas Durden. I am not sure I am feeling this Tigermobile website. Unlike the prediction one on the ATP website, I could tell by looking at my predictions which was a right prediction and which of them was wrong as they will color code it to give me an idea. I just looked in to see what I was doing and I didn’t see anything that could tell me where I was at the moment. Someone help me if I need glasses to see properly. I had to go to the leaderboard to see where I was, but what If I would like to follow where I went working my way back to my nominations at a particular matchup? Sorry I am whining Jonathan. Don’t think you can based on what I’ve seen. Maybe they can add it in for the next tournament. Yeah! It would be nice if we could see that. Yeah! It would be nice if we could see that. But I think it won’t matter much in latter rounds. Utch, you are not whining. I’ve just looked at mine and also feel that it is a bit inconvenient at moment, as one has to remember ones picks or look at them again, then the match results and finally count how many predictions one has got right. I am not on the leader board (yet), as I’ve only got 46 right. I swear my one of my Tiger Tennis picks has been changed: instead of Raonic through to meet Djokovic – which I swear is what I had, it’s changed to Puetz! No way I would have put him through – and he’s gone all the way to meet Djokovic! Even if I’d made a mistake at the beginning, I know I would have spotted it and changed it before I submitted. Very odd. I remember when I checked yesterday that Raonic was there to meet Djoko. Ah well, certainly wasn’t expecting to win but annoyed that some bug has changed my pick. They e-mailed me as well, admitting that there was a technical glitch, that messed up the positions of ‘Raonic’ and ‘Puetz’ and thereby our predictions. Wow. That’s very observant. Good catch. They didn’t mess up my prediction. Could not watch the match. Only highlights. Good start by our man. And nice review by Jonathan, but u seem to underestimate Grigor. Brown was just blown away! But it’s also true that Dimi needs to be more determined in tight matches. Courts playing faster is a good news, sudden change in conditions is not bad either. Very few have quick adaptability than Roger. So what are everyone’s scores in the Tiger Mobile Challenge ? Mine is 51 and my rank is 17 !! Watching Fed/Lu highlights – is it just my imagination or does Fed look like he is protecting his back when the points end? In the highlights – it just looks like many times a lunge ends or a run is finished with the point he goes extra slow down mode…as if something is in pain. Almost like he walks with a slight limp. I think I saw this kind of movement in 2013. If this is happening I’m not surprised to read that he had another spasm after WTF. I have seen the whole match against Lu and at no time did he look hampered. So it’s your imagination. Ok – thanks Karen. Watching J’s highlights above – now I’m not seeing it like I thought I did. I must be a crazy person. Wanting a healthy Fed …and a little too much waiting for the other shoe to drop! Fed playing very flat/without any intensity, the Italian hitting clean shot after clean shot. Roger gotta change the pace here, needs momentum stat. Hope the finger isn’t too serious. Well, this is good right?? Roger is beeing tested and he is coming out on top. It doesn’t matter (that much) that he lost the 1st set. As long as he fixes it. And… he did. Go Roger. Dimi is also through. Ofcourse Rafa will destroy his opponent next. Hope atleast Rosol comes through. Looks like Chardy’s out. Federer deals with Seppi far better, so that’s a good thing. And Smychek just came back to take the second set against Nadal. I like this guy! He’s only 5’9, with no big weapons or flashy game, but he’s managing to get the job done. Seems like a no mess no fuss, simple guy- very likeable. His game’s easy on the eye too. I’m sure Nadal will win in four, but, so far, so good. People, an interesting situation is brooding – Nadull is 2:1 down with 2:30 hours play. Ummmm 😉 . He lost. Damn. But boy do I admire this guy. His sportsman spirit is just incredible (a couple of occasions where he was the first to applaud a good point, even at 5-5 0-30 in the 5th set, he even gave Nadal a first serve in the final game. Just wow). He has a great attitude on the court. He seems like an all round great guy. I’ll most definitely be following him from now. Feel so sad that he lost. DId anyone notice Nadal hobbling around when he was down and see him rise the MOMENT he got a break in the 4th? I mean, one moment and he was a changed man. No bending over, no moaning, no grimacing, no lethargy. Such a sham. Ofcourse…. what else is new??? Yeah I agree Gaurav, wonderful sportsmanship on display from Smychek. Such a rarity. And he was soooo close. Pity. The further Nadal progresses, the more likely he is to win the whole damn thing as we’ve seen time and time again. Hoping his next opponent can take some encouragement from Smychek’s fighting spirit. Well, now I know why I have never heard of Tim Smychek. Like so many of Nadal’s opponents he gave the match away at the finish line. From 5-4 in the fifth, the quality of game that had brought him to that point disappeared with poor shot-selection and tentative execution. He covered none of Nadal’s predictable wide serves to his backhand (as Navratilova commented), to give the Spaniard an easy hold while serving to stay in the match. Nadal offers his opponents few opportunities to beat him, but he always gives them the opportunity to lose – and they mostly take it. It’s generally not their strokes that let them down but their mind. Oh, well. It at least offers hope that The Most Injured Athlete in the History of the Game doesn’t take the title this year. I saw Roger turn his match around in the second set of his contest against Bolelli, and at that point he simply pulled inexorably away from the Italian. Bolelli lives and dies by a big serve and forehand – once he starts to miss those it’s virtually game over against an opponent with Roger’s skill and variety. 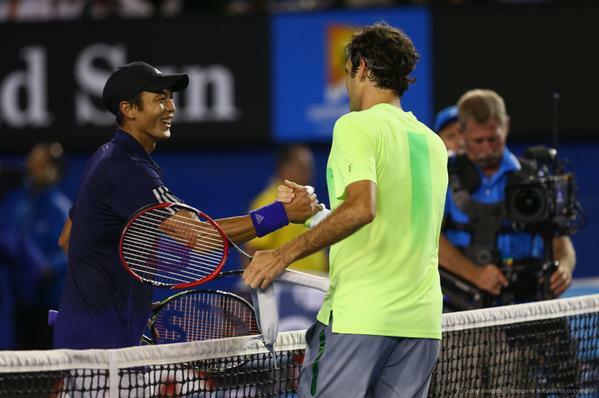 It was quite different from the Lu match, where the Chinese-Taipei player essentially tried to rescue every ball struck by Roger, until at 5-all in the 3rd our man lost patience with a contest that had gone on too long and swatted his opponent aside so that he could retire to the locker room without further fuss. I though Bolelli played well in 1st set – serve and forehand working well and clipping the lines; maybe Feds lost a bit of focus too with the bee sting. But once he got the break in second set, normal service was resumed and it was an easy run to the end.